Things That Go Beep in the Night: Is Your Smoke Detector Driving You Crazy? We’ve all been there: it’s around 3 or 4 AM, and the piercing sound of your smoke detector rudely jolts you from a deep sleep. You’re relieved to find that your home is in no danger, but good luck reclaiming your hard-won shuteye! Thoughts such as “Why was it beeping?” and “Will it go off again?” haunt you, and the possibility that you’re going to get enough rest before work becomes thinner and thinner. So what is causing this problem? And what’s the fix? There are several different possibilities, and sometimes the solution isn’t as easy as it should be – at least not for the layperson. Blast the compressed air into the openings around the alarm to directly attack the dust inside the smoke chamber. One of the most common causes of false alarms in photoelectric smoke detectors is dust, particularly in recently-built homes. As particles build up inside the alarm’s outside cover or sensory chamber, they reflect light (much like smoke particles do) and create the impression that there is a fire. Insects can find their way inside the sensor chamber as well, clogging it and creating similar problems. To stop the shriek of your smoke alarm immediately, press the “hush” or “silence” button. If it is connected to a home alarm system, simply type the ‘disarm’ code into the keypad. The key to preventing this from happening is to regularly clean the smoke detector. The easiest and most effective ways of doing this is to use a compressed air duster, available at most major electronics retailers. You’ll notice that the can is sold with a short tube that can be equipped onto the nozzle. Be sure to do this, as it will make the ejections of canned air much more focused. Several blasts from different directions inside the openings visible around the detector should be sufficient to clean out the inside. Another efficient method is to clean the inside of the alarm is to gently vacuum the inside using the soft-brush attachment. Even if you clean your smoke detector regularly, there is nothing that fills it with dust and other particles of debris faster than construction, redecoration and renovation projects. Before having construction work of any kind done in your home, have an electrician install a dust cover. This will capture the excess of dust and other debris – just make sure to remove it after the work is done! 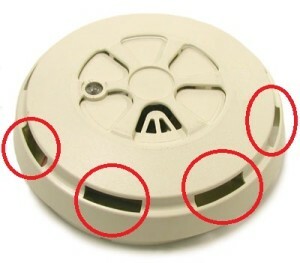 If you are hearing routine ‘chirps’ (often occurring in one minute intervals) rather than actual false alarms then the issue could very likely be that the batteries are running out of juice, and while they are usually easily accessible from the front or side of the unit, some manufacturers place them in the back. This forces the homeowner to remove it from the wall or base plate – a difficult and potentially dangerous task for some. If you do not feel confident that you can execute this safely, you should consult an electrician. There is another cause of the ever-irritating ‘chirp’ and it is wiring problems. A single loose wire is all it takes and the infernal noise will continue until the problem is rectified or you take a baseball bat to the alarm. It can also cause false alarms and even compromise your safety by causing your unit to sporadically turn on and off. Not only are you being subjected to the highly irritating shrieks of your smoke alarm when your house is not in danger, but there’s now a distinct possibility that you won’t hear that sound when you need to. The solution to this is a visit by a qualified electrician. Fortunately, the cause of the false alarms may well be external to the smoke detector itself, and the problem may be relatively easy to solve. There are many relatively normal household events that can deceive your unit into detecting trouble, and simply moving the alarm to a place where those events are unlikely to happen will usually be sufficient. 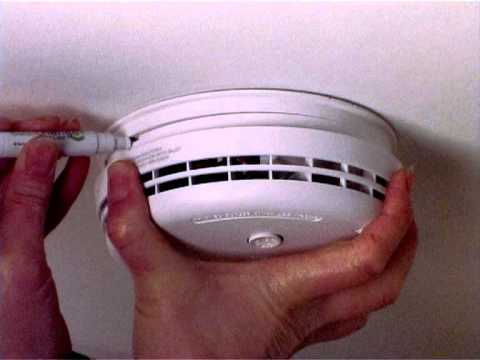 Your smoke detectors should ideally be placed at least twenty feet from furnaces, ovens and other such appliances. These produce combustion particles, which will cause a false alarm. More importantly, excessive exposure to these will leave residue inside the smoke detector and eventually destroy it. Another common cause of false alarms in the household is water vapor and steam. While both of these don’t pose as much of a threat to the health of your unit itself as combustion particles, exposure to a large amount of water vapor for an extended period of time can damage some of its most important components. Your smoke detectors should be at least ten feet from bathrooms, laundry rooms and other high humidity areas. They should also be as far away from fuel-burning sources such as fluorescent lights and heat and air conditioning vents as possible. If you’re experiencing issues with your smoke detector and the solution isn’t apparent, it wouldn’t be a bad idea to arrange a visit by a qualified electrician. That might also be the proper course of action if you have a solution that you aren’t confident you can execute safely and/or properly. Many electricians, however, have bigger fish to fry. Odd Job Handyman Services knows that your small projects are big deals, and if you would like one of our electricians to take a look at your smoke alarm system, just give us a call at (416) 520-1161 or use our online “book-a-handyman” form to arrange such a visit in minutes. Book our team before your unit starts reacting to the smoke coming out of your ears! This entry was posted in Blog and tagged smoke detector. Bookmark the permalink.